These words of encouragement, famously spoken by race director Ken Chlouber the evening before each Leadville Trail 100 mountain bike race, are surprisingly comforting when you find yourself 50 miles – and 12,424 feet – into a high-altitude Rockies ride, knowing full well that you have 50 miles left to go. So how did I get here? I may be no stranger to endurance events, but high altitude racing is no friend of mine, living as I do at sea level. But Cascade Designs also calls Seattle home, and when I was asked by the company renown for their outdoor gear to ride for their Team Platypus, I couldn’t refuse. So I packed up the car and headed to Colorado for a week of pre-race training. I couldn’t argue with getting to visit my old haunts, or getting in a mountain bike ride with local flavor (Nederland to Boulder), an epic scenery ride (Monarch Crest Trail) and fun resort riding (Winter Park). 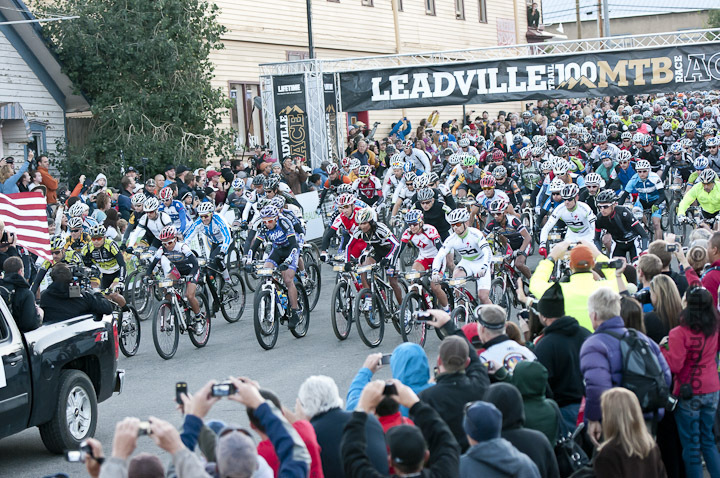 But Leadville was the culmination. That Saturday morning at 6:30 a.m., I took my place at the starting line with the other members from Team Platypus – a strong collective of riders from Washington, Oregon, Idaho and Colorado – along with 1,892 other participants from 50 states and 24 countries. 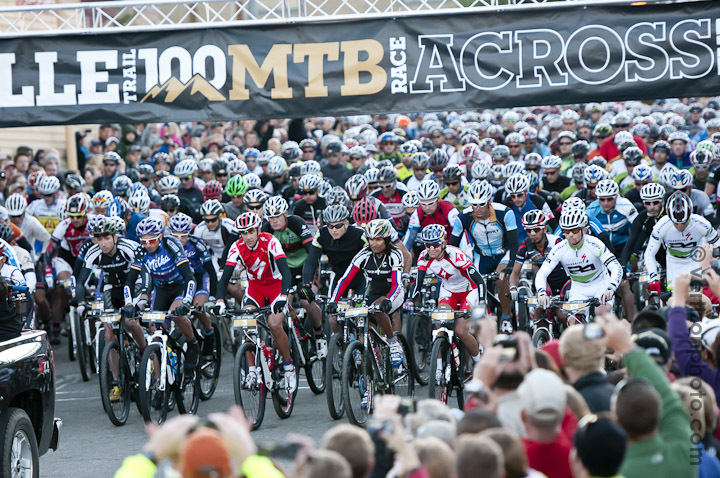 That’s right: 1,900 racers. And what’s more impressive is that to get into the single largest endurance mountain bike event usually takes some serious luck (i.e. winning a lottery entry). And there’s also the bit of luck it sometimes requires to finish 100 out-and-back mountain miles in under 12 hours. Back at the start line. With nervous excitement, we waited for the gun. 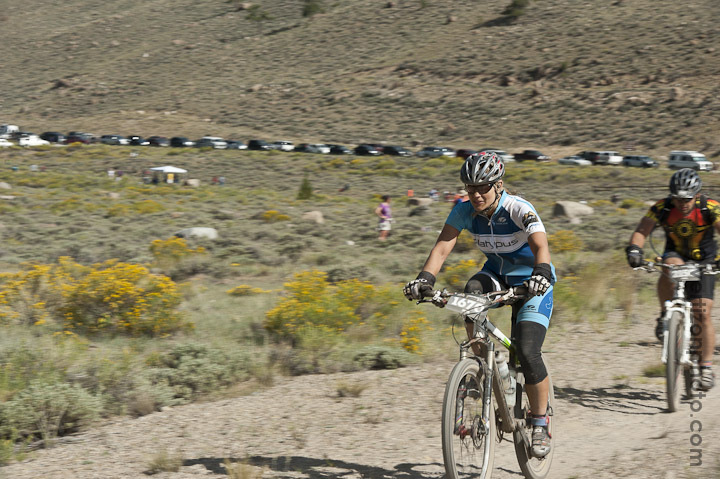 While team member Russell Stevenson got a call-up to head to the front of the pack, the rest of Team Platypus riders, being Leadville-newbies, were stuck at the back of the pack. At the time, I didn’t realize what having 1,750 riders in front of me would actually mean, but it became all-too clear over the next hour. …and going nowhere, it felt like, for 20 miles. I checked my cyclometer during the first five-mile descent on pavement, and at times our dense peloton was moving at a whopping 4 mph. When we hit dirt and a minor climb, instead of thinning us out, it became massive bottleneck. But what else could possibly happen, given the numbers participating in this epic race event? And how can you deal with an hour of spinning your wheels, with no possibilty of making any headway through the pack without acting like a total jerk, plowing your way through others who are also forced to sit idly by, spinning their wheels? Well, we laugh. And make jokes about herding cattle. Or cats. Or mountain bikers who don’t know how to ride in a peloton. I had plenty of time to share in good conversation, and it was nice. Probably the best, gentlest warm-up I’ve ever had in a race. The crowd started to thin when we got to Sugar Loaf Pass at 11,000 feet, about 19 miles in. The descent down Powerline was up next. The day before I got to ride Powerline with my teammates – it was Russell Stevenson’s idea – and Saturday’s wild descent was just as fun as Friday’s, and decidely more challenging. I had to take the ugly lines down the fast, dusty, rutted-out double track in order to dodge around racers hanging on their brake levers for dear life. 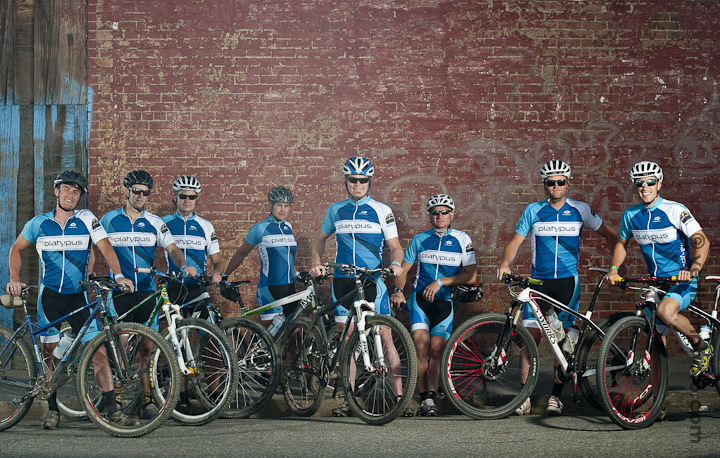 Now, don’t get me wrong – these super-fit athletes would later come back to teach me a lesson on the pavement and the dirt road climbs – but I have to say, I’ve never seen so many mountain bikers afraid of a mountain before. Then we were down, headed out on a stretch of pavement, then sailing along a couple miles of smooth, winding singletrack (the only singletrack we would see on the course) towards Twin Lakes Aid Station. And then I had a dream that I was at a mountain stage in the Tour de France, and it was almost true. I and my fellow two-thousand racers rode along a reservoir crowded with hundreds of tents and a thousand screaming people on either side – cheering for me and for everyone else in this crazy race. I felt so, so – well, cared about. I wasn’t in the lead, I was holding my own in the middle of the pack, but I had this visceral feeling that we were all in this together. With the energy the crowd gave me, I pedaled on past the aid station, en route to the infamous Columbine climb. Now, it isn’t the fact that Columbine tops out at 12,424 feet that makes my brain revolt even now, a week following the race. No, it’s the fact that I had to hike, dragging my bike up the several vertical miles on that famed mountain climb. And these aren’t normal miles. They’re “Columbine” miles: steep, sandy and rider-congested. 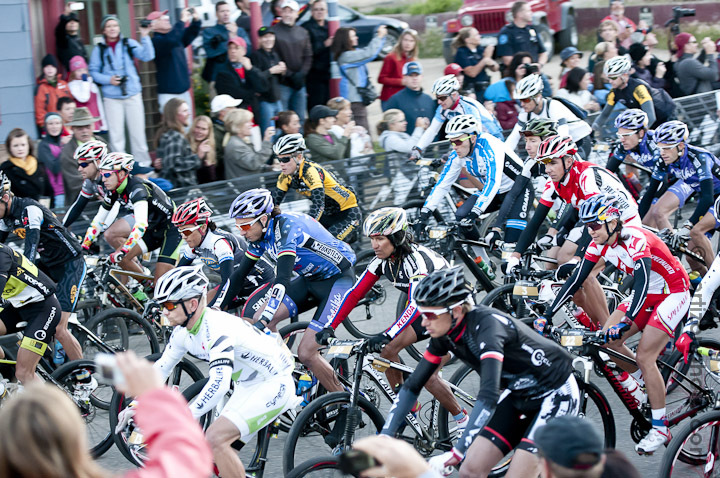 Because Columbine featured two-way traffic, riders were relegated to walking on the righthand side, a stream of hundreds of trudging riders that eliminated any possibility of riding uphill. Sigh. It hurt. A lot. But once I hit 50-mile aid station at the top of Columbine, I was on the downhill side, glad not to be in that stream of people still pressing onward and upward. I did not get a chance for my technical climb until I hit Powerline again around 75 miles. But first I stopped at the Pipeline Aid Station to restock on Perpetuum, cramp-preventing bananas and some great Platypus support from Jim and Jennifer. Then I was off for the final, uphill stretch. I had been told that the Powerline return would be the make-or-break moment of the race, and it certainly made my race: I had almost as much fun going up it as coming down it. Seriously. Okay, so I did slip out on the steepest section of Powerline and so had to walk a short bit. But it happened right where a woman was passing out cups of Coca-Cola. Ahhh. That hit the spot. Then I was back on the bike, spinning little circles again, keeping the rear wheel firmly planted as I picked my line around rocks, ruts and riders. Then it was down Sugarloaf, my intrepid Diamondback Axis hardtail romping its way past all the full-suspension bikes out there. The last 10 miles of the race felt endless, with a last paved road climb, a last fire road climb, and a last effort up the road to Leadville proper and across the red-carpeted finish line. But there I was, finished, in under 11 hours. When I saw my time, I thought to myself. Hmmm, if I could adjust to the altitude and have a more appropriate start position next time, perhaps I could drop my time by an hour… And then I thought with horror, next time?? Thanks so much to our amazing sponsors and support crew, Cascade Designs, and their Platypus hydration systems and bottles that got us through Leadville training and racing. All eight Team Platypus members finished the race, receiving silver (or gold) belt buckles with pride. Thanks to Jim Meyers for the amazing photography. You can really see what it felt like out there. Thanks to the Leadville organizers and all the people scattered across the hundred-mile course who cheered us on – and doused us with ice water when we needed it. And finally, thank you to that guy who passed me on a flat, lonely, paved section, then slowed and called out, “Get on!” Because of that blessed moment when he gave me his wheel, I was able to face the bane of my existence (i.e. pavement) and get back up to speed. 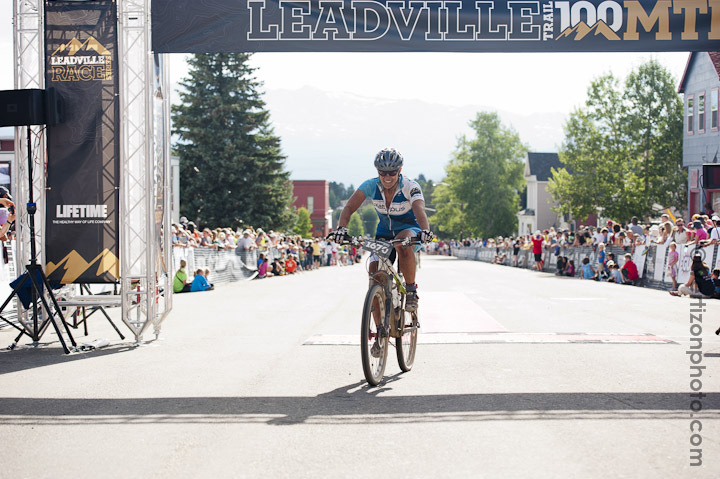 It took racing the Leadville 100 to realize that I wouldn’t have missed it for the world. 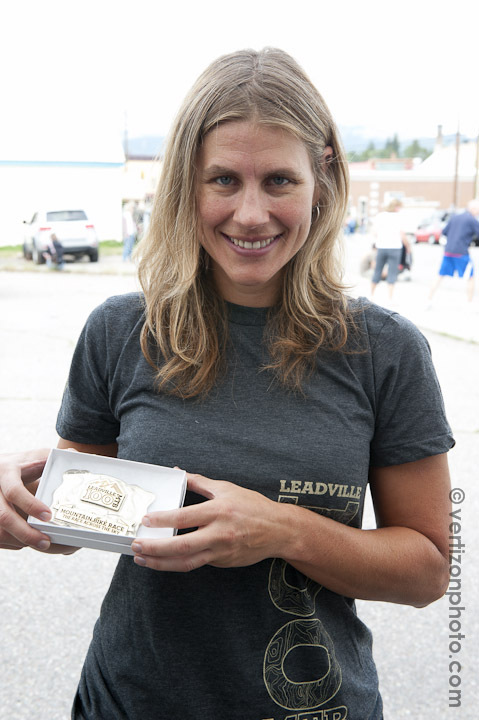 What matters at Leadville isn’t so much about the terrain as the experience itself: the people, the riders, the fans, the heaven-seeking Rockies, the literal push uphill – and, of course, the grateful return home. 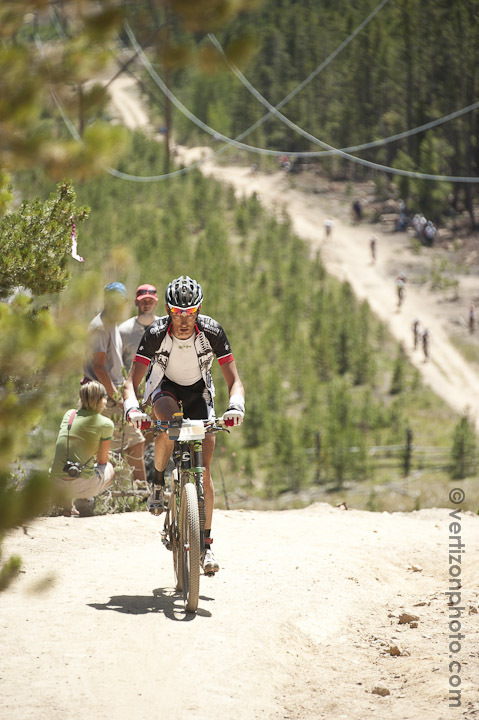 This entry was posted in Biking, Colorado, Racing/Competition, Uncategorized and tagged Cascade Designs, Colorado, Leadville, Leadville 100, mountain bike racing, Team Platypus. Bookmark the permalink.